Monarch Air Group provides private air charter in Fort Worth, TX. Our clients benefit from top-notch service, unrelenting dedication to safety, wide selection of aircraft, and years of experience in chartering private jets. To obtain a free quote, please use our online quoting tool provided below, or call toll free 1-877-281-3051. Monarch Air Group provides private jet charter flights to and from Fort Worth, Texas. Fort Worth is a city situated in Tarrant County of Northern Texas. 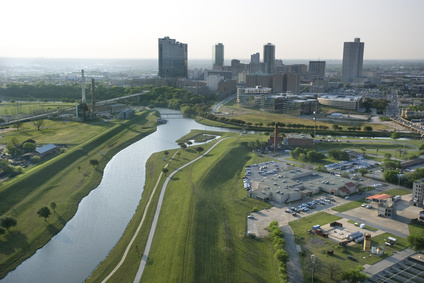 The city was established as army outpost overseeing the Trinity River in 1849, and developed as a dynamic business and cultural center. Fort Worth’s economy is mainly based on the refrigeration and communication equipment, manufacturing of aerospace and electronic equipment, computers, pharmaceuticals, machinery, food products, grain, clothing, and leather. Being one of America’s Most Livable Cities, Fort Worth is the nation’s large fastest growing city that has a population over 500,000 people. With its Old West heritage, long history, and thriving cultural and recreation facilities Fort Worth is nicknamed “The Museum Capital of the Southwest” and “City of Cowboys and Culture”. Most notable attractions are the National Cowgirl Museum, the Nancy Lee and Perry R.Bass Performance Hall, the Fort Worth Stockyards Historic District, the Kimbell Art Museum, the Log Cabin Village, the Amon Carter Museum, the Museum of Modern Art, the Cattle Raisers Museum and Museum of Science and History. Having traditional architecture, historic stockyards, and urban area design, the city of Fort Worth welcomes 8,7 million travelers every year. Situated 30 miles of Dallas, Fort Worth is served by Fort Worth Meacham International Airport (FTW), as well as by Dallas Love Field (DAL), and Dallas/Fort Worth International Airport (DFW). 9. JDB, Downtown Heliport, Dallas, United States. 10. MWL, Mineral Wells Arpt, Mineral Wells, United States. 11. RBD, Redbird, Dallas, United States. 12. SEP, Clark Field, Stephenville, United States. 13. TRL, Terrell Municipal Airport, Terrell, United States. 14. WEA, Parker County, Weatherford, United States. 1. Ashton Hotel, 610 Main Street, Fort Worth. 2. The Worthington Renaissance Fort Worth Hotel, 200 Main Street, Fort Worth. 3. Omni Fort Worth Hotel, 1300 Houston Street, Fort Worth. 4. Hilton Fort Worth, 815 Main Street, Fort Worth. 5. Embassy Suites Fort Worth – Downtown, 600 Commerce Street, Fort Worth. 6. Ashton Hotel, 610 Main Street, Fort Worth. 7. Sheraton Fort Worth Hotel and Spa, 1701 Commerce Street, Fort Worth. 8. The Worthington Renaissance Fort Worth Hotel, 200 Main Street, Fort Worth. 9. Omni Fort Worth Hotel, 1300 Houston Street, Fort Worth. 10. Embassy Suites Fort Worth – Downtown, 600 Commerce Street, Fort Worth.